Capitalizing on the successes of the independent album "Gravity Youth" and its top ten single "I Will", Tinman Jones partnered with recording label Cross Driven Records for their first nationally-released CD entitled POETIC. The new CD is produced by Alan Shacklock of Abbey Road Studios fame in Britain whose resume includes working with Meatloaf, Dennis DeYoung (Styx) and Newsboys, Phil Keagy, and Shaded Red, just to name a few. Tinman Jones felt the union stretched them creatively. "We had to approach things differently for such a major release. We new what WE wanted to do and Alan knew how to make that more widely embraced so we had to marry the two points of view. ", explains bassist Keith Alexis. The album remains true to the style of the band, yet uses that style as a launching pad to carry them farther than they have previously ventured. POETIC has plenty of hard hitting rock numbers like the title cut. Lead vocalist Bryan Alexis says the song "Poetic" ruminates the frustration of songwriting. "When you begin to try to describe God and all that He is," says Bryan, "you find out quickly how inadequate mere words can be. We try to be poets interpreting the things of God, but really we can't do it. He is beyond words." The first radio single from POETIC was "Sunshine," marrying a driving beat and flawless vocals with the simple assertion that a relationship with God sheds light on any life. "Sunshine" found its way to the number twenty slot on the national rock chart the week before the albums July 5th (2003) release date. "Say Goodbye" , the second release to radio which also achieved a top 20 position, pulsates with heavy guitar riffs, encouraging listeners to get through the spiritually dry times in their lives. New ground for Tinman Jones is broken with the addition of two down tempo numbers in "Falling Forward" and the worshipful "Crave". "Crave", after being included on a worship compilation, was picked up by American Family Radio and received nation wide air play on AFR's stations coast to coast. Another smoking tune brings rap vocalist Don Guthrie to the front to invite the listener join the "Party." This was the third radio release from the album and became Tinman Jones second song to crack the top ten as it reached a peak of #8 on the Christian rock chart. POETIC also includes new arrangements of two of Tinman Jones' top 10 rock radio hits "I Will" and "Superhero." You can still get a copy of POETIC online at a variety of prices. 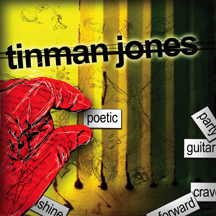 Just do a search for "Tinman Jones Poetic" and you should have no trouble finding it. 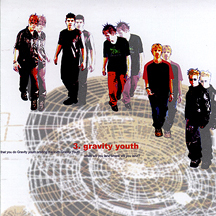 In August of 2001 Tinman Jones offered a major contender in the Christian rock market entitled Gravity Youth. It is an outstanding representation of what fans had come to expect from Tinman Jones. One reviewer stated that it is as close as you can come to experiencing Tinman Jones live. There are eleven songs on the album serving an eclectic mix of modern rock to alternative pop. The songs aren't written in a dark obscure way but rather designed to shine the light of Jesus Christ into the darkest soul. The music is energetic and edgy for those who like to rock while staying competitive with the finest alternative-pop genre if the day. Produced by Reid "Elemental" Waltz and Jef "el jefe'" Curtiss (Audio Adrenaline, Jennifer Knapp) the album is a powerful package with lots of tasty goodies for the discerning listener. Jason Halbert (Sonic Flood, dcTalk) added some keys on "Superhero" and "Etch-a-Sketch". Rick "DJ Form" Robbins (dc Talk, G.R.I.T.S.) added cuts and samples throughout the album for a really fun feel. The band has also enlisted the production skills of Nashville guitarist/producer Barry Blair (Audio Adrenaline, Bleach) for three of the tracks. The first single released nationally, "Super Hero", landed on eighty-five radio stations nation wide. The song hit number one on Jamsline's Uncle Samoos Zoo and Power FM 89.7, Dallas, and in the top ten on Christian Pirate Radio. It also landed in the top forty on Effect Radio. That was followed by the suprise hit "I Will", which is a song written from a rock's point of view. "I Will" quickly became a station favorite to play and climbed to the #6 rock song in the nation, remaining in the top ten for eight straight weeks. "Axis" followed, becoming a top twenty tune. If you like Skillet, Earthsuit, Linkin Park, Audio Adrenaline or Bleach you will like these tunes. You can download them for FREE on the right. This five song EP, EVIDENCE, was the precurser to the album Gravity Youth. It included the Reid Waltz produced "Superhero", and "Etch-a-Sketch" and added tracks "I Will", "Like You", and "Evidence". This project was recorded in Greenville, IL, under the producing wiles of Nashville guitarist/ producer Barry Blair, who was also a founding member and guitarist for Audio Adrenaline. SUPERHERO single including the song of the same name that garnered much attention on the radio scene even though the band was little known at the time. The "B" side of this single was the rock/rap favorite "Etch-a-Sketch". The producing credits on this album are the same as Gravity Youth and the keyboards were added by Jason Halbert (dc Talk, Sonicflood). The album that started it all. Hurricane was recorded in Monroe, LA under the then moniker of Heaven'z Possee (read the story). It was self produced with the help of Carvel Avis ("It's kinda got that raw quality to it" and "It wasn't too together, but it was pretty out of tune") at Soigne Studio, with engineering duties performed by Stan "rrrrrolling" Armor and some assistance by Mark Smith (Petra, Twila Paris). But the songs aren't half bad. Some may actually be called good. Hey, ya gotta start somewhere. The song Hurricane was our first song with some radio legs. It walked its way onto several stations in the region the band was known at the time and met with some good reviews. The song speaks of coming revival. The leading track to Hurricane, "Basil", is Bryan and Keith's grandfather, who was a solid man of God. He passed away just months after the band was formed and this tribute (Basil's testimony of his own salvation) was put on the album to remind us all that it is worth it to live for God all the days of your life. He was 93 when he left this earth. Sampler CD, Integrity Management (1998) ... "Apple"
Who Needs a Band?, AnonymousBands.com (2000) ... ? HM Magazine Sampler, (Jan/Feb 2000) ... "I Will"
Gye Nyame, Jimmy Swan Productions (2002) ... "I Will"
New Music 03, Reunion Records/Provident Distribution (2003) ... "Say Goodbye"
Change Your Vision of the World, Here to Him Music (2003) ... "Falling Forward", "Say Goodbye"
Devotion, Worship Extreme (2003) ... "Party"
I Could Not Love You More, Here to Him (2003) ... "Crave"